Theodor Geisel’s (aka Dr. Seuss) was a well know liberal who opposed fascism in the 1940s and people like Richard Nixon in the 1970s. His book, The Lorax, was an incredibly unsubtle attack on those who would strip our environment bare. Before he was famous, he also drew some fairly incredibly racist ads which you can see online thanks to the UCSD library. The Advertising Artwork of Dr. Seuss shows imagery of an Arab depicted as a man on a camel. The other ads are worse (click on the logos in the header image to see the images specific to that product). I don’t mean to destroy your love for Dr. Seuss though. Because Dr. Seuss Went to War and drew well over 400 political cartoons, skewering America’s double-standard on communism, nazis, anti-semitism, racism and more. There’s a distinct difference between the work one makes when hired and the work one makes when passionate. The phrase “America First” is one that has existed for years. It has an ugly history with our country. In the 1940s, some students at Yale drafted a petition to keep America our of the second World War (among them was future president Gerald Ford). They believed the only way to survive the war was to ally with Hitler. Fairly quickly there were several hundred chapters and a million members, 60% of which resided in the mid-west United States. Members included Charles Lindbergh. If you’re wondering why he dropped out of history books after his infamous crossing of the Atlantic, that’s why. Well. Part of it. The “America First” movement had major image problems as they grew larger, notably the anti-semitism of it’s leaders and members. People like Henry Ford were a problem, but so was the chairman for the US Olympic Committee, who refused to allow two Jewish runners from running in the finals of the 4×100 relay in the 1936 Berlin Olympics. The movement only had more issues, going so far as to call the Roosevelts (Franklin and Elenor) “Jews” as if it were an insult. Lindbergh sullied his name eternally in 1941, when he spoke about how President Roosevelt had created ‘incidents’ to push America into the war. The British and the Jewish races, for reasons which are not American, wish to involve us in the war. […] Their greatest danger to this country lies in [the Jews’] large ownership and influence in our motion pictures, our press, our radio, and our government. Yeah. Now you get why the guy doesn’t get talked about except for the plane stuff. He was booed. Finally, though, Pearl Harbor happened and we did go to war. Still, the damage was done by a group of people who opposed fighting Nazism and instead supported a well-armed America that kept in their place. This is probably all sounded pretty familiar to anyone who’s been listening to the current flavor of speeches by the far right. Our greatest danger is ourselves. Our hatred and our fear. I don’t know why Charles Lindbergh was so scared of Jews. I know why we were afraid of war — it’s unpleasant and deadly. But to go so far as to side with people who killed millions? To say it would be better to join forces with murders than to stand up for freedom sounds pretty un-American. “America First” is phrase used by Nazi-sympathizers. They can paint themselves as ‘alt right’ all they want, but just like ‘alternative truth’ is a thinly veiled euphemism for lies, there is but one word to call these people. They are Nazis. They do not care for you. They certainly do not care for me, a liberal Jewish lesbian. They care for themselves, for their power, and feel that ‘equality’ will somehow make them less equal. If you’re not white, male, and Christian, you’re not them. So don’t delude yourself. Maybe they’re just afraid that equality means they’ll be treated as they’ve been treating others. 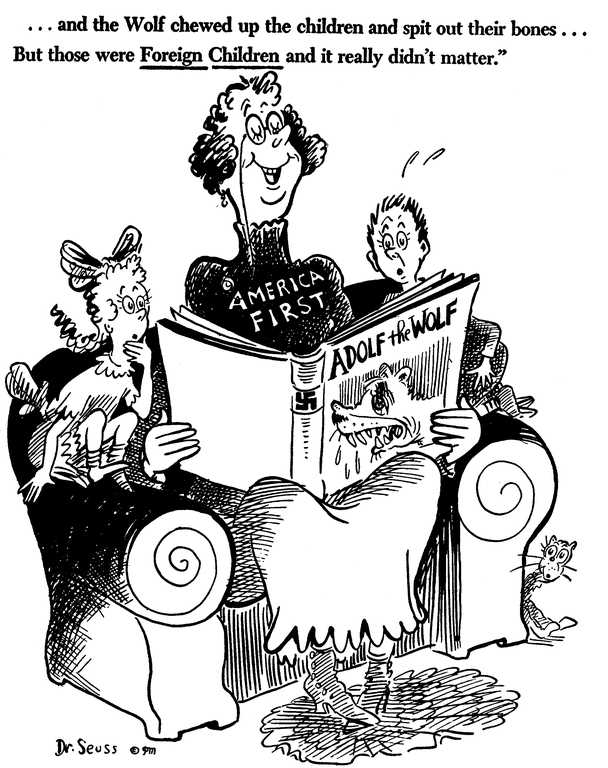 You can see more of Dr. Seuss’s anti-America First work online at UCSD.